In practice for 20 years, Dr. Anil Rajani specializes in minimally Invasive Aesthetic Medicine. He is a sought after lecture/trainer and skin care product developer. Being so multifaceted, online marketing for Dr.Rajani required WebRock Design to ‘connect the dots’ in order to showcase his industry leadership and procedural expertise. WebRock Design began by launching Rajanimd.com – this main ‘center cog’ website, introduces Dr. Rajani, and lays the groundwork for all other marketing efforts. Next, WebRock Design created individual microsites to bring a singular focus to each particular procedure or product and to facilitate targeted online campaigns to meet the marketing objectives of each one. 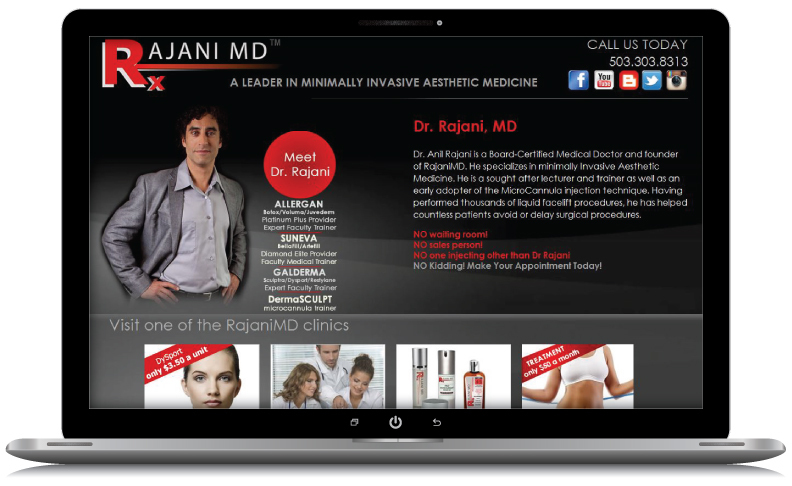 By creating unique websites and an educational youTube channel, WebRock Design succeeded in building an online presence for Dr. Rajani which has since become a reference for other practices around the nation. RajaniMD has the largest YouTube presence online – thanks to the WebRock team.